Videos, worksheets, solutions and activities to help students learn addition using number bonds in Singapore Math. 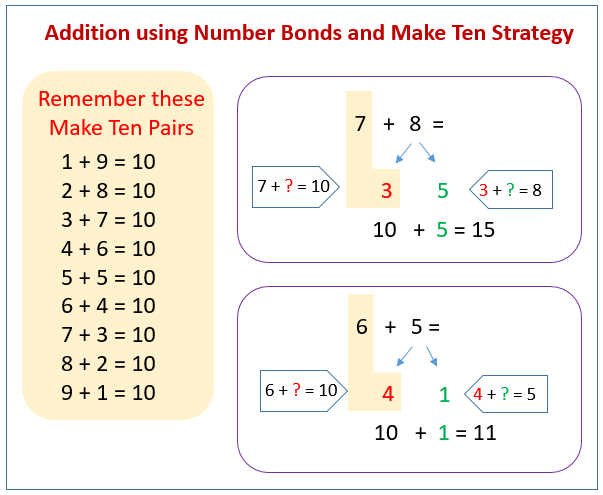 The following figure shows how to use Number Bonds and Make Ten Strategy for Addition. Scroll down the page for more examples and solutions. The "Make 10" strategy is used in Singapore Math for addition within 20. Using the idea of number bonds, the students have already been trained to recognize patterns of numbers that make 10. This pattern is then used to add other numbers. With sufficient practice, the students should be able to do the math in their heads. The following video shows how to add within 20 using the "make 10" strategy. 1. Gus has 9 cherries. Ava gives him 4 more. How many does Gus have altogether? 2. Gus has 9 hearts. Ava gives him 6 more. How many does Gus have altogether? 3. Gus has 7 stars. Ava gives him 9 more. How many does Gus have altogether? 4. Gus has 5 bouncy balls. Ava gives him 7 more. How many does Gus have altogether? When adding 2-digit numbers, the Singapore Math teaches the students to add tens and ones. For example, 53 + 28 = ? How can I use number bonds to add numbers with regrouping?